Amazon has announced that its digital assistant Alexa is now available in the Amazon Music app on iOS and Android devices. At the moment the feature is only available in the UK, US, Germany and Austria. If you’re used to using Alexa on an Echo, or Echo Dot, it will be a slightly different experience, as you won’t have access to the full range of Skills (Amazon’s name for its apps) but will allow you to make more natural track selections. For example, if you wanted to hear a song but can’t remember the title, you can say “Play the song that goes ‘And I walked off you, And I walked off an old me’’ and Alexa will play Maggie Rogers’ Alaska. Or if you wanted to have a throwback hits party, you can say ‘Play Justin Timberlake songs from the 2000s’ and Alexa will line up a playlist full of tunes from his early solo work. 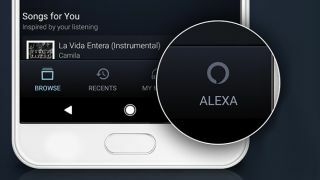 Rather than using the ‘Alexa’ command to fire it up as you would on your at-home Alexa device, there will be an Alexa push-to-talk button in your Amazon Music app. Just give it a tap and make your request. Obviously, having a physical button takes away some of the draw of using a voice interface, but it’s interesting to see Amazon increasing mobile Alexa interfaces, considering the rumors that are doing the rounds about Echo Glasses that would tether to a mobile device. For now though, you can experience Alexa on your Amazon Music app by simply updating to the latest version of the app in either the App Store or the Google Play Store. Check out our list of the best wireless earbuds.